Professor Sally Dunwoodie heads the Embryology Laboratory at the Victor Chang Cardiac Research Institute (VCCRI) in Sydney. She is a Professor in the Faculty of Medicine at the University of New South Wales. She gained a PhD researching the genetics of muscle development, at the Children’s Medical Research Institute in Sydney. She undertook postdoctoral training in embryology at the National Institute for Medical Research in London. There she identified numerous genes necessary for normal mammalian embryogenesis. 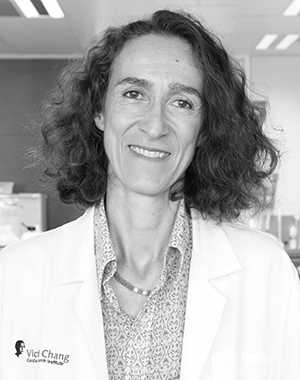 She is internationally recognised for defining genetic causes of congenital vertebral defects with diagnostic genetic tests available worldwide as a result of her research findings. Sally is embracing some of the newest genomic technologies to identify disease-causing mutations in hundreds of families with heart and vertebral defects. She is also exploring the impact that environmental factors and gene-environment interaction have on embryogenesis. Sally is the President of the Australian and New Zealand Society of Cell and Developmental Biology (ANZSCDB). She has received awards including the ANZSCDB Emerging Leader Award, the Australian Financial Review and Westpac 100 Women of Influence Award, and in 2016 she was a finalist in the NSW Premier's Woman of the Year Award.